Assignment #1, Due Thursday, September 23. Assignment #2, Due Monday, October 4. Assignment #3, Due Wednesday, October 13. Assignment #4, Due Monday, October 25. 9-6-99 Basics of Computer Design. Performance Measures. 9-8-99 Instruction Set Architecture Characteristics and Classifications. CISC vs. RISC, The DLX Architecture. 9-20-99 Data Hazards, Control Hazards, Static Branch Prediction, Compiler Pipeline Scheduling, Instruction Pipelining and Exception Handling. 9-29-99 Dynamic Instruction Pipeline Scheduling: The Scoreboard, The Tomasulo Approach. 10-5-99 Dynamic Branch Prediction Techniques: Branch History Table (BHT), Correlating Two-Level Dynamic Branch Predictors, Branch-Target Buffers. 10-11-99 Multiple Instruction Issue, CPI <1 Approaches: Superscalar, VLIW. Speculation: Software, Hardware. ILP Compiler Support, GCD Test. 10-13-99 The Memory Hierarchy. Cache Design Considerations: Organization, Replacement Policy, Write Strategies, Performance. 10-27-99 I/O Sub-System Design Considerations: Disk Storage Parameters, Bus Characteristics, I/O Performance Measures, Little's queueing theory. 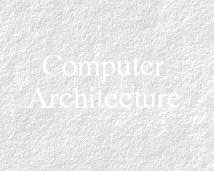 he course covers various aspects of advanced uniprocessor computer architecture design. Instruction set architecture design alternatives are discussed. Techniques to enhance performance such as pipelined execution optimizations, branch-handling, exploiting instruction-level parallelism, multiple-instruction issue and dynamic scheduling are studied. Cache, and memory hierarchy design and performance issues are also presented. Finally, the design of efficient and reliable input/output systems are covered. Computer Architecture: A Quantitative Approach, Second Edition, John Hennessy, and David Patterson, Morgan Kaufmann Publishers, 1996. Week1: Fundamentals of Computer Architecture Design, Performance Measures Review. Instruction Set Principles Review and Examples. CISC vs. RISC. A Typical RISC Example: The DLX Architecture. Week2: CPU Pipelining Concepts Review, Pipeline Hazards. Branch Handling: Static branch prediction Static Compiler pipeline scheduling. Pipelining and Exception Handling. Week3: Advanced Pipelining, Exploiting Instruction-Level Parallelism (ILP). Pipeline Scheduling, Loop Unrolling. Instruction Dependencies Analysis. Week4: Dynamic Instruction Scheduling: The Scoreboard Approach, The Tomasulo Approach. Week5: Dynamic Hardware-based Branch Prediction. Week6: Exploiting ILP Further: Multiple-Instruction Issue Approaches: Superscalar, VLIW. Software and hardware Speculation. Compiler ILP support. Week7: Cache Design Issues, Memory-Hierarchy Design. Advanced Techniques to Improve Cache Performance. Week8: Storage Systems, Bus Design, I/O Performance Measures and Benchmarks Reliable Storage: Redundant Array of Inexpensive Disks (RAID). I/O System Design Issues. This page is 20Kbytes long and was last modified on: Monday, 25-Feb-2008 17:16:00 EST.